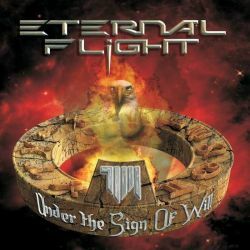 I really tried hard to give it a shot, but Eternal Flight hardly ever even reach an average level on their second album Under The Sign Of Will. Maybe it’s because they categorise themselves as a melodic power prog metal band, which results in a stylistic grey area where they are too heavy to be melodic, too straight to be prog and too soft to be power. Add to this a muddy production, and you end up with an album which will have a very hard time to make a stand in a world of high quality metal releases. It’s a shame, because the guys from the French side of the Alps are all very good at what they do. On the up-side, the vocalist has a trademark clear voice, the guitars have enough pressure. The down-side gives us a drum production with too little transparency and keyboard sounds that sound plainly cheap. Eternal Flight are at their best when they emulate a melodic prog sound as known from Queensrÿche, a band that must have left an impact on them, but unlike the Seattle pioneers, the French never seem to dare to take stylistic risks, and that’s another point where they fail miserably. When you notice that a band has talent but no vision, you just don’t like to listen to them anymore. Upon reading what other reviewers had to say about Eternal Flight, I even wondered if I was listening to the right band. Under The Sign Of Will is maybe not a sign of bad will, but it’s a too long collection of lacklustre proto prog metal songs that lose the little charm they have with the sub par production. Even genre fanatics can find better new CDs than this.